Les fouilles poursuivies par l’un de nous (VM) à la Grotte du Noisetier (ou Peyrère 1) à Fréchet-Aure (Hautes-Pyrénées) ont permis de récolter, par tamisage, plus de 80 000 vestiges réputés déterminables (sur près de 140 000 restes) de microvertébrés. Parmi eux, deux molaires rhizodontes d’un minuscule arvicolidé ont été isolées. La taille réduite, l’abondance de cément dans les angles rentrants et la nette séparation des triangles t1 et t2 attestent leur appartenance au phylum mimomyen de Mimomys reidi – M. pusillus et M. blanci étalé sporadiquement sur l’ensemble du Quaternaire. Chronologiquement, cette nouvelle découverte se place dans la lignée de Mimomys blanci (Van der Meulen 1973), dans la période isotopique de MIS 3 ou plus ancien, en présence d’industrie moustérienne, et précède Mimomys salpetrierensis (Chaline 1980) de la fin du Würm. Morphologiquement, Mimomys pyrenaicus nov sp. est intermédiaire par sa taille entre Mimomys blanci et Mimomys salpetrierensis comme il l’est dans la chronologie. Il diffère cependant de tous les autres Mimomys de la lignée par l’absence de triangles clos et la présence associée d’un « rhombe pitymyen » nettement développé, qui en font les caractères spécifiques de ce nouveau taxon. 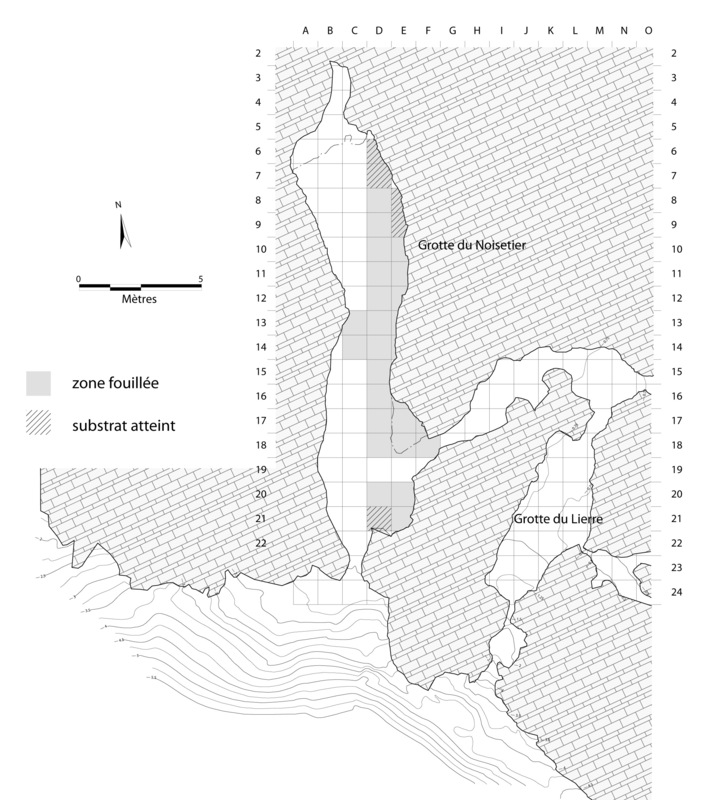 Vincent Mourre excavations in the Grotte du Noisetier (or Peyrère 1) permit to gather by sifting more than 80 000 determinable rests of microvertebrates. Among them, two rhizodont molars of a minute Arvicolid have been isolated. The small size, the abundant cement in the re-entrant angles and the distinctly wide separation of t1 and t2 triangles attest their belonging to the mimomyan phylum of Mimomys reidi-M. pusillus and M. blanci, extended sporadically over all Quaternary. Chronologically, this new discovery takes place in the descent of Mimomys blanci during the stage MIS 3, in presence of musterian industry in the begining of the last glaciation and precedes Mimomys salpetrierensis from the end of Würm. It is a pleasure, and not a mere duty, for us to extend our heartfelt thanks to all those who helped to carry out this work and to whom we dedicate this article. Thanks to M. Allard and all those who brought us so much. I would like to add my profound gratitude to Françoise Delpech who kindly corrected the text and reformatted the presentation. 1Noisetier Cave (or Peyrère 1) is located on the western slope of the Aure Valley, on the townland of Fréchet-Aure just outside the village, at an altitude of 825 m and 145 m above the valley floor (Mourre 2010) (fig. 1). The main gallery is oriented north-south and the entrance opens towards the south (fig. 2 and 3). 2After the rescue excavation by M. Allard (Direction Régionale des Antiquités de Midi-Pyrénées), conducted in the central zone of the cavern, we took over the determination of the microfauna extracted by V. Mourre’s team over a period of five years (Jeannet 2001). This work involved the examination of 139,840 remains, 82,267 of which were judged to be determinable (Mourre et al. 2008). Figure 1 - Location of the Grotte du Noisetier (according to French grand atlas map; Reader’sDigest selection). 3This set of data from level 1 was dated by AMS to 42 ka BP (+3100/-2300) (Gif 7997), and contained two molars with roots from a minute arvicolid: a first lower right molar (M1D) in a perfect state of conservation and a third upper right molar (M3D) without the posterior loop (fig. 4). The Mimomyan morphology and the deposit conditions raise questions as to the origin, the chronology and the kinship of these teeth. A link with Mimomys salpetrierensis (Chaline 1980) seems to be ineluctable. 4Noisetier Cave is a subhorizontal gallery overhanging the Neste at 140 m. It opens due south at an altitude of 845 m, opposite the Aspin pass. It is the ideal site for large birds of prey, which can brood and survey the surrounding slopes for prey. Nearby, the fields, forests and the glacial trough of Val de Louron extend and diversify their hunting grounds. Figure 2 - Fréchet-Aure - Grotte du Noisetier. 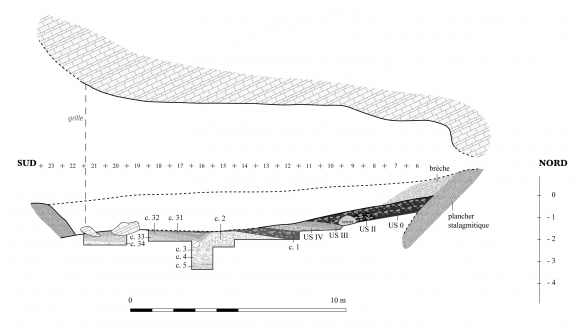 Cave plan and digged zones (DAO V. Mourre). Figure 3 - Fréchet-Aure – Grotte du Noisetier. Longitudinal cutting on C/D axis (DAO V. Mourre). 5The M1D (fig. 4 a, b, c) was discovered in the square D18, (in the porch area), with a Z reading of 204. It is recorded as n° FGN.402-6393 and belongs to level 1a. 6The M3D (fig. 4 d, e, f) is issued from the stripping of square D16, in the central zone, between the Z readings = 240 and 250. It is recorded as n° FGN. 451-7174 and belongs to level 3. 7This spread out distribution seems to indicate that these molars do not belong to the same specimen even though their morphology links them to the same species. 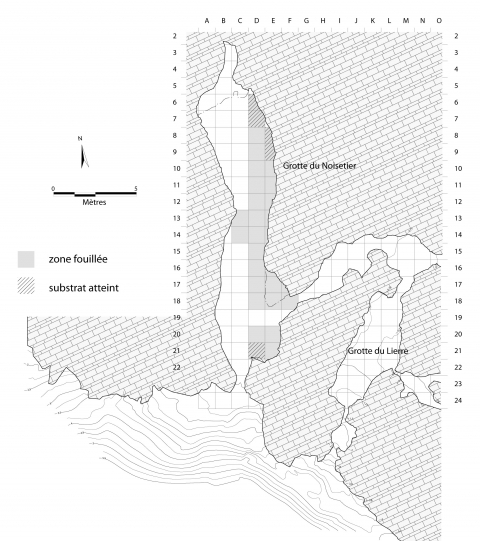 Figure 4 - Fréchet-Aure - Grotte du Noisetier. Holotypus of Mimomys pyrenaicus n. sp. a/ buccal face ; b/ occlusal face ; c/ jugal face. Scale = 1mm. Paratypus : amputated M3D of posterior loop. d/ buccal face ; e/ occlusal face ; f/ jugal face. Common scale = 1mm. 8The list and identification of the remains found in association with each of the two molars illustrates the taxinomic abundance of each series (tab. 1) and the biodiversity of the complex as a whole. Tableau 1 - Fréchet-Aure - Grotte du Noisetier. 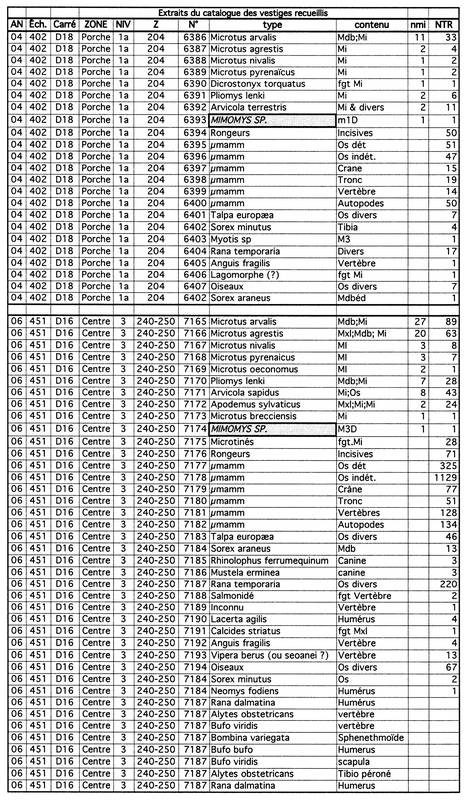 Extract of catalog recording assemblages of remnant associated to Mimomys pyrenaicus nov. sp. molars. Abbreviations: Top of columns: AN: digging year; Éch. : Sample n°; N°: part n°; nmi : minimal number of individuals (rodents only); NTR: Total number of rests; Z: depth. Column “contenu”: éd: toothless; fgt: fragment; Mdb: mandibule; M1: Upper molar; m1: lower molar; Mi: alone molar; Mxl: maxillary; Os dét: determinable bone (bone with epiphysis or characteristic); Os indét. : indefinite bone (splinter, diaphysis). 9With the first lower molar, in level 1a, the presence of the collared lemming (Dicrostonyx torquatus) can be misleading as to the severity of climatic conditions; but it is important to bear in mind that this species is only represented by a single remain out of a total number of more than 80,000 determined remains and that the ten other taxa are associated with relatively temperate climatic conditions. It is possible that this species came to seek refuge in a mid-mountainous region, during a period of climatic warming, as the cavern was closed off by ice or firns at this altitude, during a periglacial phase (850 m). 10As for the rodents from level 3, only the northern vole (Microtus oeconomus) adds a cold note: its presence indicates nearby marshy zones. Unlike the collared lemming, this species is present in most of the samples and all the levels of the infilling. 11The climatic conditions of the final Pleistocene from layer b2 from Salpétrière Cave presents a very different suite of taxa around Mimomys salpetrierensis (Chaline 1980), where five species out of eight can withstand very harsh climatic conditions. Four of these are still present locally, apart from the water vole (Arvicola terrestris); the field vole (Microtus arvalis), the European snow vole (Microtus nivalis), the wood mouse (Apodemus sylvaticus) and the garden dormouse (Eliomys quercinus). 12The significant climatic differences which emerge from the faunal associations from Noisetier Cave and Salpétrière Cave could explain, if not validate, the morphological differences between the molars, as we showed for Arvicola terrestris from Chênelaz (Jeannet and Cartonnet 2000). 13The right M1 (fig. 4) clearly shows an Arvicola type chewing function with several surprising particularities: the tiny size and the absence of closed triangles. Laterally (fig. 4a and 4c), the tooth presents a high crown, two sturdy roots and abundant cement in the internal angles. On the sides of the molar, the linea sinuosa (Rabeder 1981) follows a very simplified line, very different from the “gloved finger” shape of Pliocene species. It reaches the chewing surface at the tips of the posterior loop (bp) and on the front of the anterior loop (ba), creating an interruption of the cordon of peripheral enamel. On the anterior loop, in spite of the advanced age of the animal, the interruption is clearly shorter than in most of the Lower Pleistocene Mimomys. We note the absence of the Mimomyan fold adjoining the t4 and the enamel « puiselet » perforating the anterior loop, which is very frequent in primitive forms. 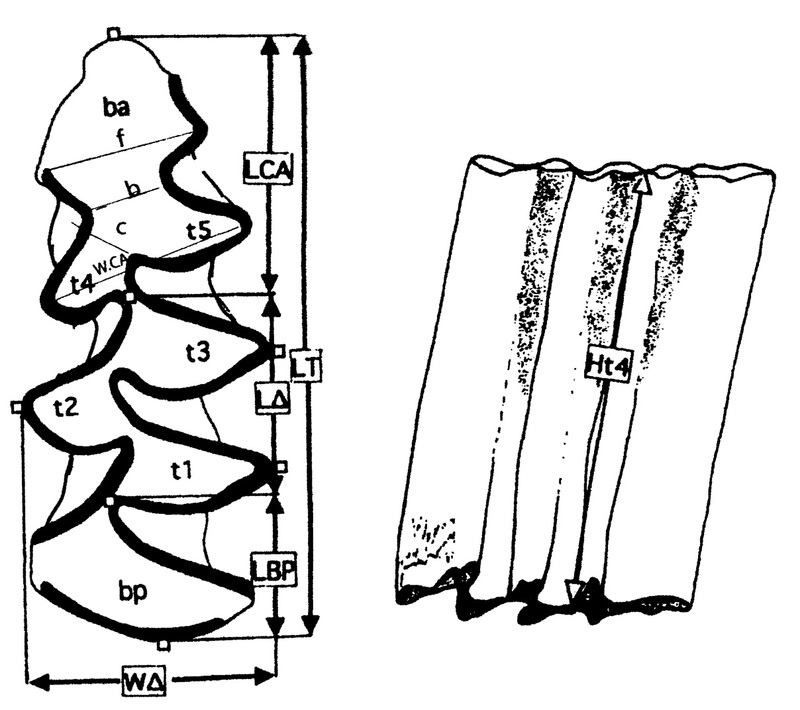 Due to these morphological lacunae, the reduced size and the wide space separating the t1 and the t2, the Fréchet form is similar to the Mimomys pusillus lineage (Méhely1914). Figure 5 - Biometry. Measurement technique of the different elements of the Arvicola m1. a/ Mastication table of a left m1 molar. ba = Anterior loop. bp = Posterior loop. b = Anterior complex constriction. c = neck t4/t5.f = Anterior loop width. t1, t2, t3, t4, t5: = sub-triangular elements constituting the molar body and delimited by peripheral enamel cordon. L.CA. - Anterior complex length. L.BP. - Posterior loop mesio-distal length. LT. - Molar total length. L . - Trigonid mesio-distal length (Triangles t1, t2, t3). W . - Trigonid width. b/ Lateral jugal view of m1D Ht4 = Molar height between high and low contacts of t3-t4. (The molar jugal curvature allows for this measurement). 14We have not been able to observe and compare the intertwined enamel structures (Chaline and Laborier 1981), but the other morphological similarities are sufficient and clear enough to justify the attribution of the molar to the Mimomys genus to a form close to Mimomys pusillus (Méhely 1914), in the same way as G. Rabeder (1981). The comparison with Mimomys blanci van der Meulen 1973, another descendant of Mimomys pusillus, is much more conclusive. We observe the interval separating the t1 from the t2, the abundant cement on the internal angles, the simplified linea sinuosa, the breaks in the enamel, slight retraction on the anterior loop, ²which is widened but asymmetric. The length of the Fréchet molar is in keeping with the variations of those of Mimomys blanci but remains below average (2.49 mm). The Middle Pleistocene species from Italy provides the criteria missing from Mimomys pusillus for a close assimilation with the Fréchet Mimomys, such as the narrow break in the enamel at the front of the anterior loop and the sporadic presence of cement in the internal A6 angle. 15The last criterion inherited from the Mimomyan lineage which was not evoked by the different cited authors is the variation in enamel thickness for which we will simply observe that the enamel is not very differentiated. According to the SDQ (Schmelzband Differenzierungs Quotient) method elaborated by W. D. Heinrich (1990) (fig. 6), this value is 107 for the m1, like for the m3 from Fréchet.This value confirms that the molar belongs to the Mimomys group, by displaying thicker posterior enamel walls for the triangles than those of the anterior walls (tab. 2). This is inversed in modern Arvicola molars. 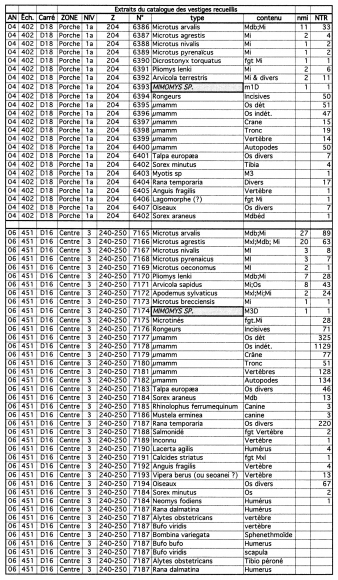 This same table shows the most widespread measurements for Mimomys pyrenaicus nov.sp. Figure 6 - Biometry - According to W.D. Heinrich (1990), measuring technique and processing for the definition of the SDQ (Schmelzband Differenzierungs Quotient). 16Chronologically, the Fréchet m1 is closer to those from Salpétrière Cave, excavated by F. Bazile in 1979, which were the subject of two publications (Chaline 1980; Chaline and Laborier 1981). In Mimomys salpetrierensis, the m1 presents a structure of enamel fibres similar to that of Mimomys pliocènes, as shown by C. Laborier with a scanning electron microscope. Moreover, the detailed description and the measurements bring to light the minuscule size, (Lm1=1.55 mm), the presence of two roots, thick, poorly differentiated enamel, a wide space between t1 and t2, abundant cement in the internal angles and a poorly indented linea sinuosa reaching the chewing surface in front of the largely unrestricted anterior loop and at the tips of the posterior loop. 17These diverse characteristics are present on the Fréchet m1, cited previously in the comparison with the other Mimomys. The most marked difference is the tiny size of Mimomys salpetrierensis compared to all the others, including the Fréchet molar: 1.55 mm for Mimomys salpetrierensis, 2.31 mm for Mimomys pyrenaicus nov. sp. and 2.49 mm on average for Mimomys blanci. 18Above all, the intermediary postion of the Fréchet molar between Mimomys blanci (van der Meulen 1973) and Mimomys salpetrierensis (Chaline 1980) is noteworthy, as regards the chronology, the size and the morphology. 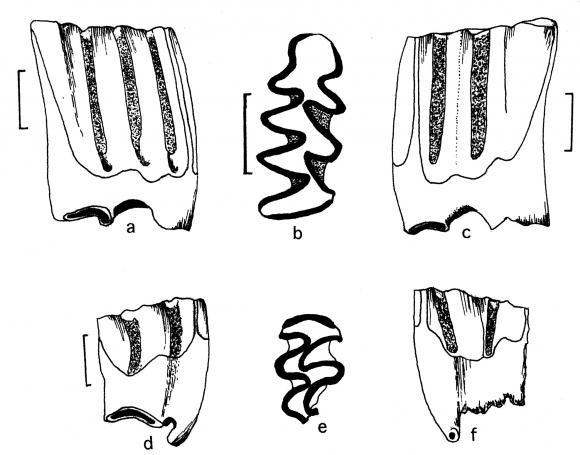 19These diverse distinctive parameters prompt us to consider the Fréchet molar as a well-individualized species, due to its morphology characterized by the absence of closed triangles and the presence of a pitymyan rhombus. These two associated morphological criteria are not present in any Mimomys of the “reidi- pusillus-blanci” lineage. For these diverse reasons and criteria, we believe that it is pertinent to create a new species which will serve as a chronological marker for similar ulterior discoveries. 20Derivatio Nominis: Name derived from the geographic sector of the discovery, indicating in particular the refuge zone of endemic species. 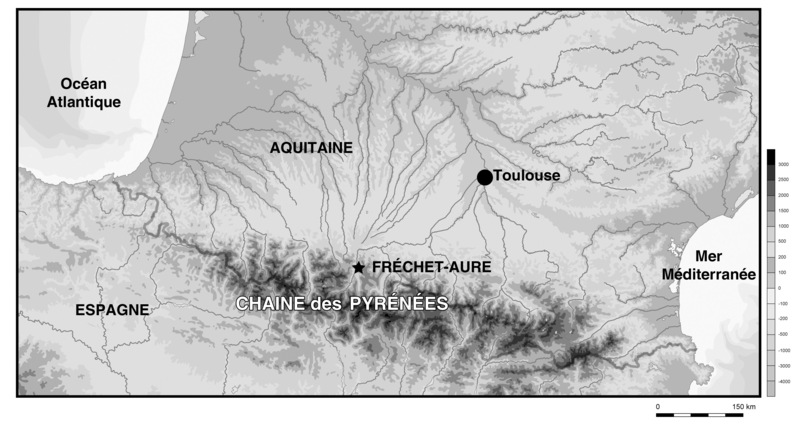 Type locality: Noisetier Cave (or Peyrère 1), townland of Fréchet - Aure, (Hautes-Pyrénées, France). Type level: layer 1a (MIS 3), containing a Mousterian industry. 14C AMS date from level: (Gif 7997) = 42 ka BP (+3100/-2300). 21Diagnosis: Small-sized Mimomys (L.m1= 2.308mm). The m1 has no Mimomyan fold and no enamel islet on the anterior loop. Interruptions of the peripheral enamel cordon on the front of the anterior loop and the lateral tips of the posterior loop. Absence of closed triangle: wide corridor between triangles t1 and t2. Presence of a well-developed Pitymyan rhombus. From a lateral view: poorly indented linea sinuosa reaching the mastication table. Abundant cement in the internal angles. Poorly differentiated enamel on the walls of the triangles but of ancestral type (posterior walls thicker than the anterior walls; SDQ = 107). 22Paratype: the posterior loop has been removed from the M3D and it is thus impossible to take measurements. It bears two roots, one of which is a longitudinally elongated anterior root, the other is a posterior sub-cylindrical root. Comes from layer 3 from square D16 dated by 14C AMS to 47 ka +/- 2000 BP (Poz 14255). Very thick, poorly–differentiated enamel and an identical SDQ (=107) to that of the m1. Abundant cement in the internal angles (catalogue n°: FGN 451-7174). Tableau 2 - Fréchet-Aure - Grotte du Noisetier. Biometric data of Mimomys pyrenaicus nov. sp. molars. 23The discovery of rodent remains from the Mimomys genus is important for several reasons. It led to the creation of a new species: Mimomys pyrenaicus nov. sp. It confirms the fact that the Pyrenees Mountains acted as a refuge for species that are endemic today. It enables us to add a link in the Mimomys reidi - pusillus – blanci lineage. With Mimomys salpetrierensis, D. Janossy’s idea (1970) of defining the Lower Pleistocene/Middle Pleistocene through the disappearance of Mimomys is thus partially called into question. But this is also true for other groups, such as Pliomys or Allocricetus, which were presumed to have become extinct during the Eemian and which survived sporadically in several Upper Pleistocene refuge zones. We can also evoke the European adder (Vipera berus) which evolved towards the Baskian viper and occupies the Cantabrian region and naturally the Pyrenean desman (Galemys pyrenaïcus), found in fossil form at the site (Jeannet 1996; Allard and Juillard). Arvicola terrestris (the European water vole) retained a Pyrenean enclave whereas the rest of the population turned towards Asia. The other logical consequence of these close links with the Mimomys genus is plainly the nomen nudum characteristic of the Nemausia genus (Chaline and Laborier 1981), which J. Chaline himself seems to have abandoned, judging by the Mimomys salpetrierensis appellation that he used. Agenbroad L.D. 1989 - Spiral Fractured Mammoth Bone from Nonhuman Taphonomic Processes at Hot Spring Mammoth Site. In : R. Bonnichsen, M.A. Sorg (Eds. ), Bone Modification. Orono: Center for the Study of the First Americans, University of Maine, p. 139-147. Agenbroad L.D. 1990 - The mammoth population of the Hot Springs site and associated megafauna. In : L.D. Agenbroad, J. I. Mead, L. Nelson (Eds. ), Megafauna and Man. The discovery of America’s Heartland. Hot Springs, South Dakota: Mammoth Site of Hot Springs, p. 32-35. Agenbroad L.D., Mead J.I. 1987 - Age structure analysis of Mammuthus columbi, Hot Springs, South Dakota, Current Research in the Pleistocene 4, p. 101-102. Agenbroad L.D., Mead J.I. 1994 (Eds.) - The Hot Springs Mammoth Site: a Decade of Field and Laboratory Research in Paleontology, Geology, and Paleoecology, Mammoth Site of Hot Springs. South Dakota, Inc., Hot Springs. 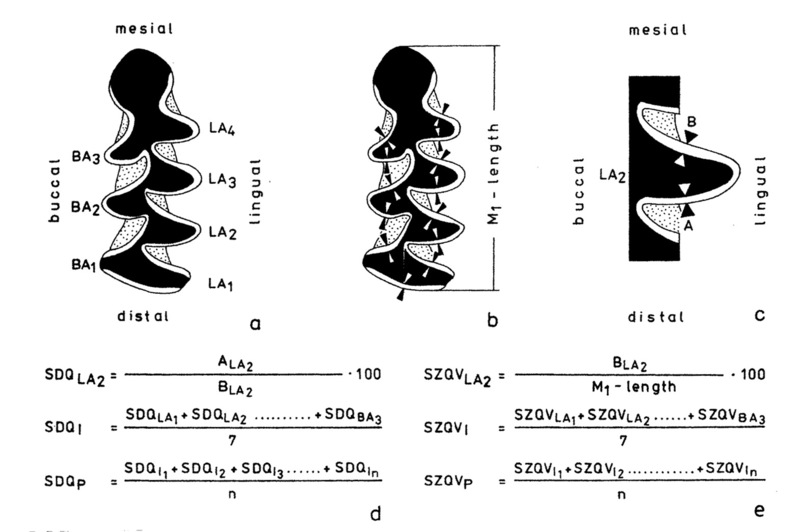 451 p.
Andrews P., Lord J.M., Nesbit-Evans E.M. 1979 - Patterns of ecological diversity in fossil and mammalian faunas. Biology journal Linnean Society, 11, p.177-205. Aulagnier S., Haffner P., Mitchell-Jones T., Moutou F., Zima J. 2010 - Guide des mammifères d’Europe, d’Afrique du Nord et du Moyen-Orient. Paris, Ed. Delachaux et Niestlé. 272p. Beden M. 1979 - Les Éléphants d’Afrique Orientale : systématique, phylogénie, intérêt biochronologique. Thèse de la Faculté des Sciences Universitaires de Poitiers, 2 vol., 567 p. (inédit). CRAIG G.C. 1991 – in: Haynes G. 1991 - Mammoths, mastodonts and elephants. Biology, behavior, and the fossil record. Cambridge University Press, 413 p.
Dutrow B. 1980 - Metric analysis of a Late Pleistocene Mammoth Assemblage, Hot Springs, South Dakota. M.S. thesis, Southern Methodist University (unpublished). Figueirido B., Pérez-Claros J. A., Torregrosa V., Martín-Serra A., Palmqvist P. 2010 - Demythologizing Arctodus simus, the “ Short-Faced ” long-legged and predaceous bear that never was, Journal of Vertebrate Paleontology, 30: 1, p. 262-275. Fisher D.C, Fox D.L., Agenbroad L.D. 2003 - Tusk growth rate and season of death of Mammuthus columbi from Hot Springs. South Dakota, USA Deinsea, 9, p. 117-133. Fleming T.H. 1973 - Numbers of mammal species in north and central America forest communities. Ecology, 54, n° 3, p. 555-563. Guérin C., Faure M. 1987 - Grands Mammifères. In : J.C. Miskovsky et al., Géologie de la Préhistoire : méthodes, techniques, applications, Géopré édit., Maison de la Géologie, Paris, p. 801-830. Hannus L.A. 1989 - Flaked Mammoth Bone from the Lange Ferguson Site, With River Badlands Area, South Dakota. In : R. Bonnichsen, M.A. Sorg (Eds. ), Bone Modification. Orono: Center for the Study of the First Americans, University of Maine, p. 395-412. HAYNES G., 1987 : Proboscidean die-offs and die-outs : Age profiles in fossil collections. Journal of Archaeological Sciences. 14(6) : p. 659-668. Haynes G. 1991 - Mammoths, mastodonts and elephants. Biology, behavior, and the fossil record. Cambridge University Press, 413 p.
Laury R.L. 1990 - Geologic History of the Mammoth site and Surrounding Region Hot Springs Area, Fall River and Custer Counties, South Dakota: An Overview. In : L.D. Agenbroad, J.I. Mead, L.W. Nelson (Eds. ), Megafauna and Man. Flagstaff, Arizona, p. 15-21. Laws R.M. 1966 - Age criteria for the African elephant, Loxodonta a. africana. East African Wildlife Journal. 4, p. 1-37. Legendre S. 1989 - Les communautés de mammifères du Paléogène (Éocène supérieur et Oligocène) d’Europe occidentale : structures, milieux et évolution. Ed. F. Pfeil., München 265 p.
Louguet-Lefebvre S. 2005 - Les mégaherbivores au Paléolithique moyen en Europe du Nord-Ouest : paléoécologie, taphonomie et aspects palethnographiques. British Archaeologial Reports, International Series / S1451, 357 p.
Louguet-Lefebvre S. 2006 - Determining the age of death of Proboscids and Rhinocerids from dental attrition. Oxbow, Icaz Durham 2002, International Council of Archaeozoology, 9th Conference, 23-28 August, p. 179-188. Madden C.T. 1981 - Mammoths of North America. Ph. D. thesis of Colorado University, Ann Arbor, 271 p. (unpublished). Maglio V.J. 1973 - The origin and evolution of the Elephantidae. The American Philosophical Society, 62, 149 p.
MEAD J., HELVY R.H., Agenbroad L.D., 1990 – Late Pleistocene Invertebrates and Plant Remains, Mammoth Site, Black Hills, South Dakota. In : L.D. Agenbroad, J.L. Mead, L. Nelson (Eds. ), Megafauna and Man. The discovery of America’s Heartland. Hot Springs, South Dakota: Mammoth Site of Hot Springs, p. 9. Montuire S., Marcolini F. 2002 - Palaeoenvironmental significance of the mammalian faunas of Italy since the Pliocene. Journal of Quaternary Science, vol. 17(1), p. 87-96. Osborn H.F. 1942 - Proboscidea, a Monograph of the Diversity, Evolution, Migration and Extinction of the Mastodons and Elephants of the World, Vol. II: Stegodontoidea, Elephantoidea. American Museum of Natural History, New York, p. 805-1675. Péan, S. 2001 - Comportements de subsistance au Gravettien en Europe centrale. Thèse Doct. mnhn Paris. 413 p. (unpublished). Saunders J.J. 1970 - The distribution and taxonomy of Mammuthus in Arizona. M.Sc. thesis of Arizona University, Tucson, 115 p. (unpublished). Stanford D., Wedel W. R., Scott G. R. 1981 - Archaeological investigations of the Lamb Spring site. Southwestern Lore 47(1), p. 14-27. Valverde J.A. 1964 - Remarque sur la structure et l’évolution des communautés de vertébrés terrestres. Terre et Vie, III, p. 121-154. Marcel Jeannet and Vincent Mourre, « Mimomys pyrenaicus nov. sp.a new Upper Pleistocene Arvicolid (Mammalia, Rodentia) from the Pyrénées (Fréchet-Aure, Hautes-Pyrénées, France) », PALEO, 24 | 2013, 139-147. INRAP Méditerranée, UMR 5608-TRACES, 561 rue Étienne Lenoir, Km Delta FR-30900 Nîmes - vincent.mourre@inrap.fr.